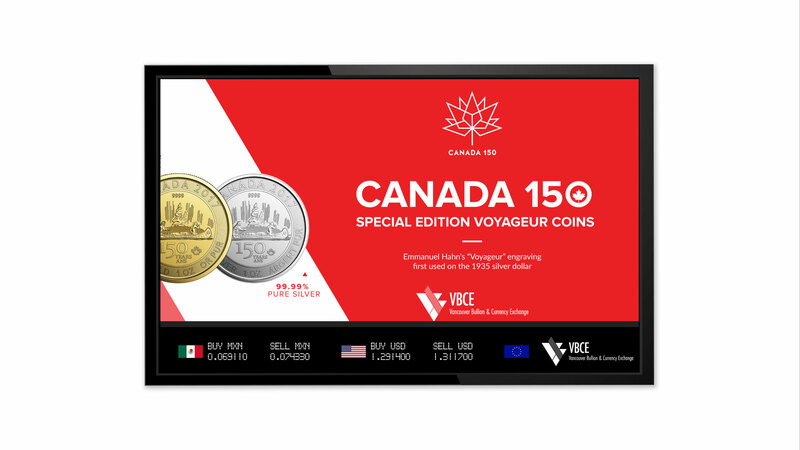 Vancouver Bullion & Currency Exchange (VBCE) is the leading private foreign exchange company in Western Canada. They have been in business for over twenty five years and handle over three billion dollars in transactions a year. VBCE presents the unique opportunity of operating 3 stores in the Metro Vancouver area. Our challenge was to devise an effective way to advertise VBCE’s diverse set of services and products while showcasing VBCE’s involvement in the community to in-store customers. We created a system of digital slides that are accessed over the internet so that all store locations can display them over a TV display as a monitor. Slides are created in layers and are easy to update, which creates a smooth workflow and facilitates a flexible update schedule. With this system, customers can get shared information and updates about VBCE easily at any of the store locations.